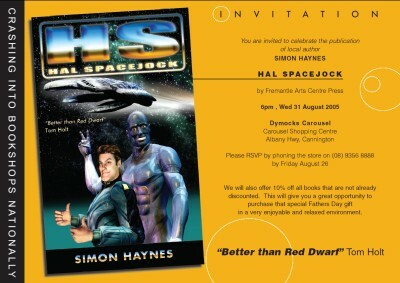 First off, the Hal Spacejock book launch is tomorrow night. People are still RSVPing despite the 26/8 cutoff date, which is great. Sounds like we'll have more than 60 people, and one newspaper is going to run a writeup on the launch after the event. In other news, my editor believes Hal 2 is a nice leap ahead from Hal 1, which is great. The last thing you want to do is follow the first title with something not as good. Not that I'd write endless Hal novels to cash in - I write to entertain myself, so each book had better be snappy, funny and moving or I'll find some other series to read. I've just about finished the mods to Hal 2, which goes back to the editor on the 6th of September. I'll get it back a week or so later for a final polish, and then it'll hit production. I think this one will be out in April next year, and I'm setting up a 'Hal 2 notification page' combined with a draw for a free copy upon release. Enough for one post. If you're coming to the launch tomorrow night, say hi. And if you emailed me since Sunday night - I haven't got your message yet. I got the red-inked manuscript for book two back today, along with five pages of notes from Janet Blagg, super-editor extraordinaire. And what did I find tucked in the padded envelope with this slab of work? A pristine, new, 3cm thick, real live, dead-set gorgeous copy of Hal Spacejock! 393 pages of my blood, sweat and tears, printed on natural, recyclable paper from wood grown in sustainable forests and lovingly bound in a cover designed by Adrienne Zuvela using Les Petersen's terrific artwork. This isn't a wishy-washy tome of slender dimensions, it's a thud-worthy novel of hand-to-hand combat proportions. If I was stuck in the trenches, I'd want a couple of these protecting MY vitals from stray bullets, I can tell you. Hopefully the vast majority of the book-buying public will agree, and with a bit of luck Hal Spacejock will hit the counters in army surplus stores across the nation. Hey, if I had to light a cooking fire in a hurry, I know what I'd choose! How to lose customers - FAST! I have a spare dial-up internet account with a major Australian phone company. This is purely a fallback in case my broadband goes down - although my regular ISP provides a dialup service, it's bound to be clogged within minutes of any outage. This spare account costs me $5.95 per month, and I get 1 hour of 'free' usage in that time. I never use the thing, I just check mail via my usual ISP once every few weeks to get the spam and the occasional credit card billing notice. Today I got an automated reminder telling me that my card had expired (I got a new one a couple of weeks back.) They wanted me to log in and update the expiry date so they could process the $5.95 bill. Duly chastened, I went to their web page and entered my login details from memory. Wrong. Tried again. Wrong again. Tried one more time, and got a message to the effect that my account was now locked for three hours for my own safety. I figured I'd email them to let them know that I would try again tomorrow. In their 'update your card' email I found the following: If you have any questions regarding these charges, please contact the Customer Support Centre by e-mail on accounts@bigphonecompany.com (name changed to protect the twits) So, I wrote to them and a few minutes later I got the following reply: ** This is an auto-generated message to let you know you have sent an email to an unattended mailbox. Please do not respond to this email. ** This email now told me to visit a special customer page to contact them. I did so. It asked me for an email address, so I gave them my regular one, and I skipped all the crap about which software I'm using, how much money I have in the bank, the names of my children and which OS I have on my PC (I once made the mistake of picking Linux for this kind of thing, only to get a curt email telling me they didn't support Linux - despite the fact I was emailing to upgrade my internet account...) Now I just make it all up, confident that whatever I put they will ignore it and get me to explain it all over again. I hit SUBMIT and was immediately struck by two things. One, they wanted me to complete a full page of information on my address, phone number, etc, etc because they didn't recognise my email, and two, they wanted $14.95 to proceed with my 'support query'. Do what!? I'm writing to let them know that I can't enter my card details because I'm locked out, and they want me to pay for the privilege? Yes, I stuffed up my password a couple of times, but any company which employs Monty Python to design their customer support department doesn't want me as a customer. Therefore, I'm cancelling the account. If I need a backup ISP I'll pick a small, local company with real people on the other end.